Son of Don Juceph; born in the village of Ablitas, near Tudela, from which place he derived his name; died in 1342. He was known as "the rich Jew of Ablitas." He had business relations with the King of Navarre and Aragon. The King of Aragon and the nobles of Navarre borrowed from him large sums, which they failed to repay. On this account Ablitas was unable to fulfil his obligations to the state. After his death his grandson, Don Ezmel de Ablitas, and a Christian citizen of Tudela were made administrators of his estate and obliged under oath to deliver his whole property, consisting of furniture, money, gold and silver vessels, vases, carvings, and the like, his whole fortune, both personal and real, being confiscated in 1343 by the Queen of Navarre. How large a sum must have come to the treasury by this confiscation can be seen from the record of documents published by Jacobs—a single indebtedness from the king of £53,000 is cited (see "Jew. Quart. Rev." viii. 487). 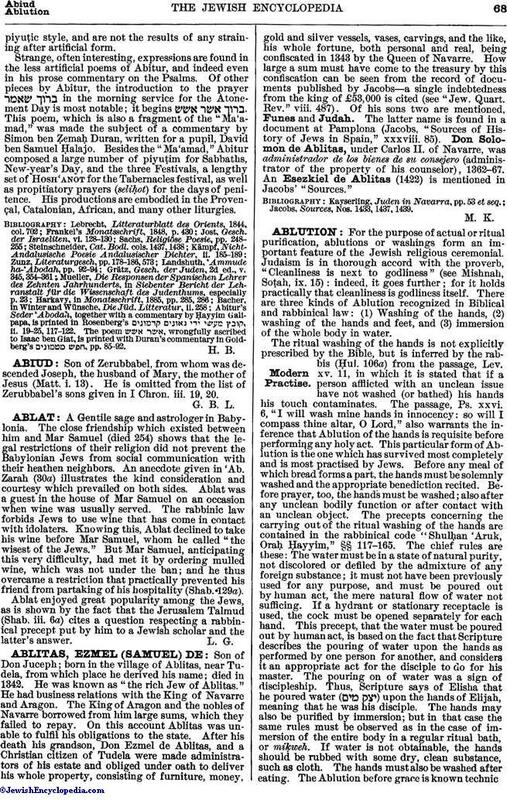 Of his sons two are mentioned, Funes and Judah. The latter name is found in a document at Pamplona (Jacobs, "Sources of History of Jews in Spain," xxxviii. 85). Don Solomon de Ablitas, under Carlos II. of Navarre, was administrador de los bienes de su consejero (administrator of the property of his counselor), 1362-67. An Esezkiel de Ablitas (1422) is mentioned in Jacobs' "Sources." Jacobs, Sources, Nos. 1433, 1437, 1439.